Abuja, September 20th 2017. 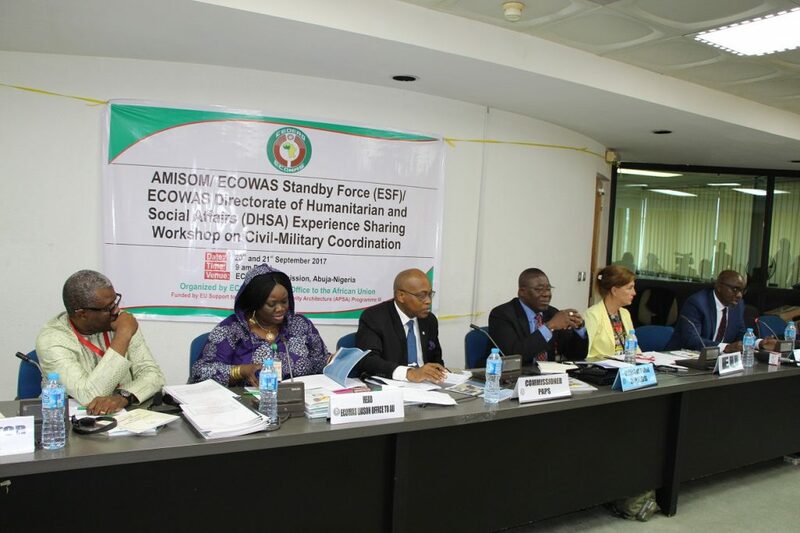 Personnel of ECOWAS Standby Force (ESF) and the African Union Mission in Somalia (AMISOM) as well as officials from their respective Commissions are sharing experiences on civil-military coordination with a view to improving the level of collective response to the challenges of peace and security on the continent. In this vein, a two-Day Workshop at the instance of the ECOWAS Directorate of Humanitarian and Social Affairs (DHSA), opened in Abuja, Nigeria on the 20th of September 2017 to explore ways of strengthening synergies between the instruments of the continental and regional bodies in relating with the Humanitarian Action and Natural Disasters Support (HANDS) and in facilitating the ECOWAS/AU collaboration in the implementation of the African Peace and Security Architecture (APSA), among others. 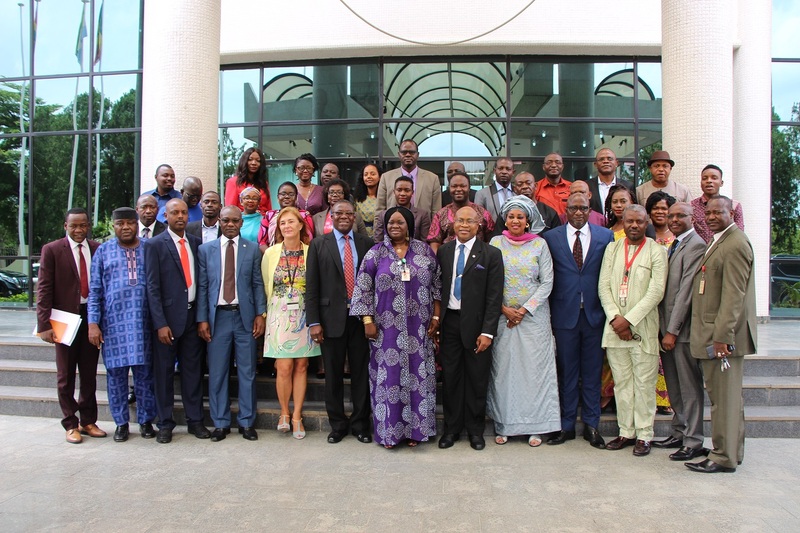 Declaring the Workshop open, the ECOWAS Commission’s Commissioner for Political Affairs, Peace and security Mrs. Halima Ahmed stated that the African people are the gainers of the collaborative efforts aimed at exchanging real life experiences between AMISOM and ECOWAS. The Representative of the AU Commission’s Peace Support Operations Division (PSOD) Semiha Abdulmelik and her counterpart at the Department of Political Affairs (DPA) Mr. Wafula Renny sued among others for the sustenance of cross- cutting policies which aid experience sharing. They favoured the harmonization of guidelines for promoting complementarity and multidimensional approach to humanitarian response. There were also goodwill messages from the funder of the peace support project – the European Union which Head of Delegation to Nigeria and ECOWAS Mr. Ketil Karlsen reiterated that the EU’s support to the ASPA road map is demonstrated by its decision to work with the ECOWAS Commission to include in its ongoing 10th European Development Fund a support to contribute to the ECOWAS regional peace, security and stability mandate. Overviews were given of the AMISOM experience, operational mandate, progress and prospects, humanitarian assistance/experience, as well as the ESF mandate among others. Speaking through the issues raised which included the establishment of a formal coordination relationship between ECOWAS ESF and DHA with AMISOM towards future collaboration as well as a communication policy that enhances greater synergies, the Head of ECOWAS liaison to the EU Ms Raheemat Momodu stressed the need for participants to use the two-day exercise productively. “Let us be open and candid. Making mistakes, learning from (and sharing of) them is better than faking perfection” She added. A broad presentation was made by the Ag. AMISOM Chief of Staff Adebayo Kareem covering the operational structure, the internal dynamics of the Somalia debacle, the international and regional peace restoration efforts, coping with asymmetric warfare, the institutionalization of after-action review, challenges as well as prospects. Organized by the ECOWAS Liaison Office to AU in co-junction with the ECOWAS Programme Management Team (PMT) of the EU Support to APSA Programme III and the ECOWAS Peace Fund, and with the active participation of the ECOWAS Directorate of Peace Keeping and Regional Security, the Workshop featured other goodwill messages from a host of partners including officials of civil society organizations and the Nigerian Ministry of Foreign Affairs.